Nicolai Howalt, b. 1970 in Copenhagen graduated from Denmark's Photographic Art School Fatamorgana in 1992. His Photographic works draw on documentary Traditions, but are also inspired by art and photography history. The conceptual and abstract are an equally integrated part of Howalt's art. The collision of different states, domains or worlds is a recurrent theme in series like 3x1, BOXER, Car Crash Studies and Borders. Howalt's works have been shown in numerous solo and group exhibitions in Denmark and abroad. His works are represented in central collections and museums, including La Maison Européenne de la Photographie, France, MUSAC, Spain and The New Carlsberg Foundation, Denmark. Howalt's most recent project Light Break, currently on view at Edel Assanti in London, has its origins in the archive of Danish scientist Dr Niels Finsen, and continues Howalt's exploration of conceptual photography and installation. Christiane Monarchi recently met with the artist to discuss the inspiration behind his most recent works. Christiane Monarchi: Your new project Light Break contains a number of images produced in working with the medical archives of Dr Niels Finsen in Copenhagen, whose research and experimentation with phototherapy had ground breaking medicinal applications in the 19th century. What was it initially about Finsen's work that attracted you and made you want to start your own artistic research? Nicolai Howalt: Dr. Niels Finsen is a very famous doctor in Denmark, known for his research with light therapy around 1800-1900. Most of us in Denmark grew up knowing about the history of his work at the beginning of the 19th century. In particular, I have been drawn to his capacity to work with light as a healing force. It is the light I am particularly interested in; what light really looks like, seen through his medical tools. Then I examine in Light Break the visual traces of light the patients were treated with. How do these rays communicate? What do they represent and how do we understand them today, since the medical use of this kind of light therapy is out of date. Similarly, I examine Ultraviolet light colour and its expression, which in practice cannot be experienced visually, as the colour temperature is so low that it is invisible to the human eye. So basically my work in Light Break is about making the invisible visible. CM: Finsen's work considered the targeted use of Ultraviolet light, invisible to the eye, to heal diseased tissue. As photography obviously involves the visible light spectrum, how did you interpret the idea of UV light in creating photographic works? NH: What is interesting with UV light, indeed, is that it is not visible to humans. Some of the UV rays are viewable by the human eye, but only as a product of photography. Where photography becomes really interesting for me is when the photograph is being used quite soberly and precisely, and when the photograph opens up and tells us something we did not concretely look at in the picture. That's why the challenge in my work is to follow Finsen's steps and visualize this through his lenses, filters and machines. To see what is not immediately visible. Some of the works are created by simply letting sunbeams shine through his crystal lens here in my studio. Light penetrating the glass creates a spacious image, an outcome that could be identified as an eye, a tunnel, one microscopic bacteria etc…. CM: In your current exhibition at Edel Assanti one image you have sourced and carefully re-presented as a photogravure is of a female patient with shocking and painful looking skin disease; a nearby portrait of an antique wax 'moulage' made from the face is exquisitely rendered down to the inclusion of eyelashes. They feel visceral but also uncannily serene at the same time, perhaps in a way reminiscent of your previous Car Crash Studies. What did it feel and look like working with all these archival images and masks, documenting so much trauma but also hope? NH: What I think is interesting about these portraits of women, is that they are sitting in their nicest clothes, while the purpose of the photograph was for the research of the disease. Yes, the photographs show a certain serenity, but also a beauty that can be depicted underneath the disease. A confrontation within the silence of the portrait and the fight against the disease. 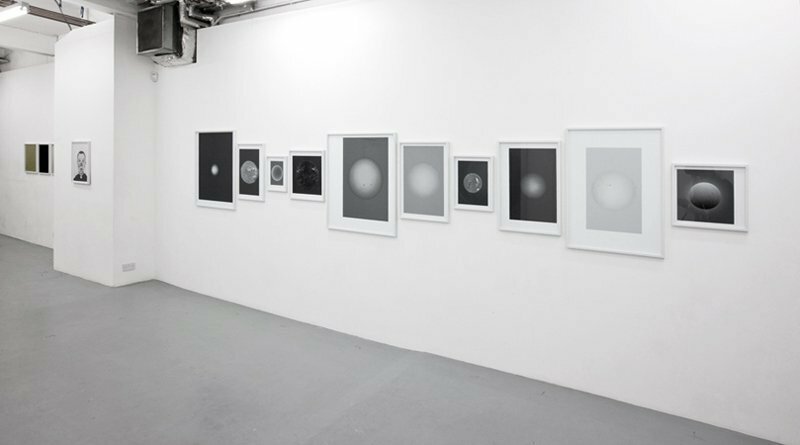 CM: Moving around the exhibition, the images you created with Finsen's archive are interspersed with black and white images of the sun. Could you tell us a bit more about the creation of these pieces? NH: These images of the sun are all produced by different uses of the photographic medium. It shows different perspectives of what the sun has to offer us. The beauty within it, its nourishing aspect but also the burning sensation. This last idea can be depicted through the portraits of the patients, since the surface of the diseased skin has similarities with the surface of the sun. The way I have chosen to install them is also significant. By giving them different sizes and different white borders around the image, the floating sun is put into perspective in a straight line, in a framework of all different sizes. That way you get multiple suns (12 suns, 9 at the show), a form of a musical harmony. CM: Three small abstract works at the entrance of the exhibition introduce the only colour in this otherwise monochrome exhibition. How were these works made? NH: The three colour works were all made from surfaces from Finsen's light machine. The blue magenta work shows the surface of a UV light filter made of copper sulfate molded into glass, through which the scratches in the surface makes it possible to see the parts of the colour spectrum. The yellow piece is also the surface of a UV filter - Finsen used to rule out other rays than the UV - and the last work is sunlight that has broken through Finsen's gathering apparatus, representing a projection of 'light break' from a prism. CM: Moving from micro observation of light, through our own haptic human scale, to the macrocosm of space and stars, there are feelings evoked in your present work which are reminiscent of your previous series Endings. These patients will have eventually passed on, regardless of suffering or cure, while the sun continues to shine on in oblivion to humankind and its medical advances. These thoughts transcend the visual, and have remained with me ever since. Congratulations on this exhibition, and I would love to know what you may be inspired to work on next. NH: I am glad that you see a connection between my work with Endingsand Light Break. It's obviously two very different works, both of which, however, have a starting point in an existential understanding of life and death, light and darkness. Overall, I am very interested in putting together the abstract and concrete, which summarizes my projects in general. What I am working on now is open, so it's hard to concretise the work yet, but I'm still working on my most recent work with light and Finsen's study of light. A publication is planned later this year.